In the 1890s, before automobiles, it was important to locate a building on a streetcar line. 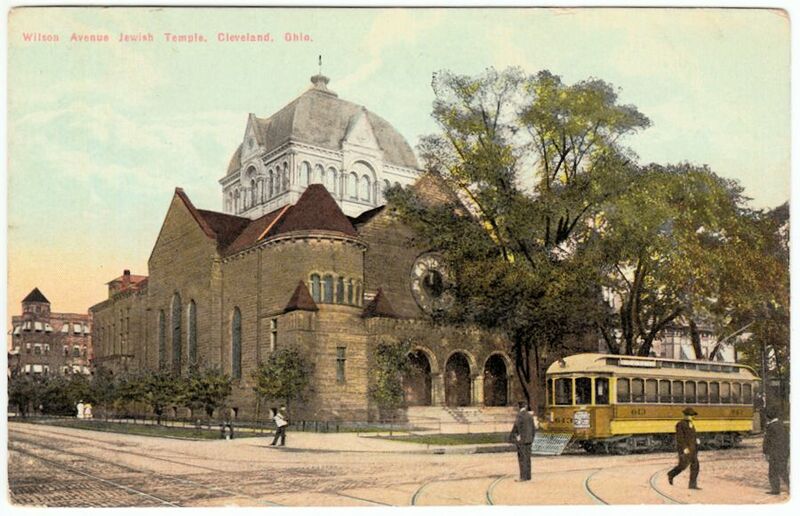 This enlarged copy of an old picture postcard shows The Temple-Tifereth Israel at the intersection of two: East 55th (then Willson Avenue) and Central Avenue. Here Moses Gries, first American-born rabbi of our first Reform congregation, held Sunday morning services. In a time of six-day work weeks and laws aimed at keeping stores closed on Sundays, this adjustment to American life allowed many more members to attend weekly worship. Some complained that Rabbi Gries had moved the Sabbath to Sunday. But it was Rabbi Aaron Hahn who had started the Sunday services, which included a slightly modified version of the week-day prayers. Built in 1894, this may have been the first Jewish institution on East 55th. There would be many more including B'nai Jeshurun (our first Conservative synagogue), and the daily Yiddishe Velt, read by our rapidly growing Eastern European population. In 1924 The Temple, now led by Abba Hillel Silver, moved to University Circle and sold this building to a church. Another church - Friendship Baptist - owns the building today, but with only 40 members it faces foreclosure on what had once been the spiritual home of more than a thousand Jewish families.